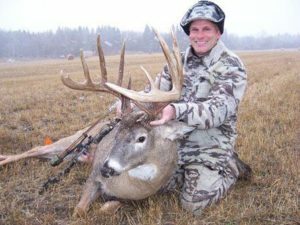 A quiet secret that not many bowhunters are aware of – is the incredible deer hunting in and around Edmonton, Alberta. What makes it special? Genetics of course are part of it- but the real reason that the area is so hot for giant bucks is that it is a bow only zone! And has been for many years! A huge area of ground reserved exclusively for bow hunting! 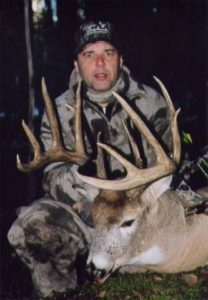 Deer grossing over 200 have come from there, and a giant 198 gross was taken by this outfitter personally, a few years ago! Of course this bow hunting only area means relatively untroubled deer, visible deer, active deer, old deer! Add genetics, great food, and you have a recipe for world class whitetails. He guides in his favorite Management unit and in several other nearby units, plus he will offer you semi-guided hunting at a slightly cheaper rate! These deer are very susceptible to rattling, grunting and bleating, being lightly hunted for years! 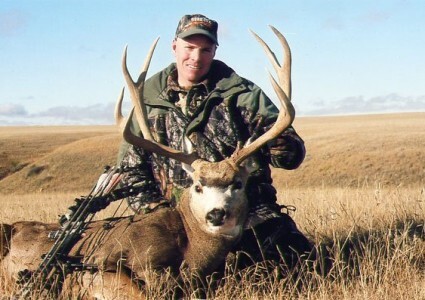 In addition to his great whitetail hunts, he also offers guided and semi-guided bear hunting (bow); guided and semi guided elk hunting (bow); guided and semi-guided moose hunting (bow) and the same for prairie dwelling mule deer! THIS IS A BOW ONLY OUTFITTER!!! And there are only a few bowhunters in Alberta, meaning light to non-existent hunting pressure. 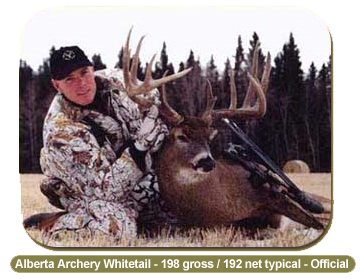 His fully guided Whitetail trips take place in the Edmonton bow only area which is never open to rifle hunting. 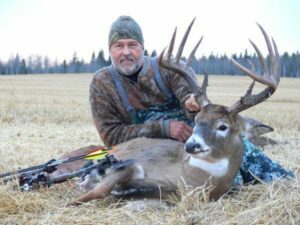 As a result, hunting is for some of the world’s largest farmland whitetails and they offer the archer an excellent chance for success. Note that the early hunt prices are a bit less expensive, and may offer a BETTER chance to catch bucks in their feeding patterns. Of course, the rut can have a giant show up at any time, so consider rut hunts as well. Normally we would expect a bowhunter here to be looking to arrow a deer in the 140 to 180 class, although of course deer over 150 are never easy, nor are they behind every row of corn! But you will be hunting in an area where bucks scoring in excess of 170 points are regularly seen. The average weight of mature bucks is 230 lbs. with the largest in excess of 300 lbs. Alberta has very little resident bowhunting pressure as there are only 13,000 bowhunters in all of Alberta!! Hunting is done primarily from portable pin mount tree stands. Several different stand locations are placed for each day and each hunter, to insure that you use the wind efficiently and also to avoid overhunting stand sites. Old deer are not stupid! Due to the sensitivity of the trophy whitetails, alternate stands are placed for different wind conditions to allow hunting without disturbing natural travel patterns. Stands are placed on travel routes to bedding areas for morning hunting and adjacent to feeding areas for evening hunts. This is just as it should be. Opportunity on Pope and Young quality whitetails is normally 100%, and his personal best was an official 192 net. Rattling and grunt and bleat calls have proven to provide excellent success during the pre-rut and rutting periods, and the outfitter guesses that perhaps 50% of the trophy whitetails are shot due to calling. So what can you expect to see? Typically during a six-day hunt, 30 to 60 deer are sighted per hunter. He believes shot opportunity on trophy deer is at least 130%. 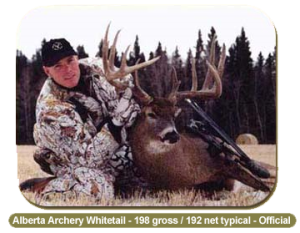 Bow hunting for Alberta trophy whitetails is not easy. Success usually depends a good deal on the individual hunter’s dedication and effort. Good preparation including scent control, quiet clothing, sound tactics in calling and rattling, plus good shooting and hard work are all essential for big trophies. All his guides are dedicated to bow hunting. Hunting is done at the hunter’s pace, not the guide’s. Assistance is offered in all aspects during your hunt. None of his guides are smokers and he will expect that you adhere to certain restrictions during your hunt if you are a smoker. 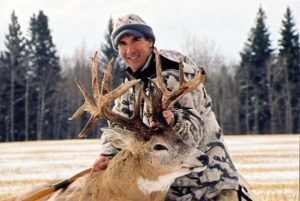 His fully guided hunts include guiding, accommodations, meals, transportation to and from the hunting area, as well as preparation of game (excluding butchering) for exporting. Gratuities for guides and staff are at the hunters discretion and are not included. There are no hidden costs. He generally has no more than 4 hunters in camp at a time. POLICIES: There is a 140 inch minimum. A non-fatal hit will cost you $500 donated to the Whitetail Habitat fund. License costs are not included in the pricing. Licensing arrangements should be made in advance as permits are purchased prior to the hunter’s arrival. Licensing fees for U.S. citizens are approximately $450.00 U.S. The exact license amount will be advised to hunters in a written communication the outfitter will send you prior to the hunt. Flights to Edmonton are booked at the hunter’s cost and responsibility. Flights must be booked to arrive at least one day prior to the first day of the hunt and to depart the morning after the final day of the hunt. Stay those two nights in motel at your expense. Allowing one extra day for weather is always a good idea in case of weather delays! This rut hunt is in western Alberta (WMU 328) using all terrain vehicles to access timbered areas. The hunt is a 2X1 hunt from a tent camp, located about 2 hours from Edmonton. Two hunters in camp! Hunts are a combination of stand hunts and calling. Dates are early to mid-September and are BOW Only. License is about $500. Two nights for motels is about $150 if needed. And the shuttle is $25 per person. . You will work hard on these elk hunts, be ready to do so. If you do, opportunity on a bull should be in the 50 to 75% range. Tips are extra. 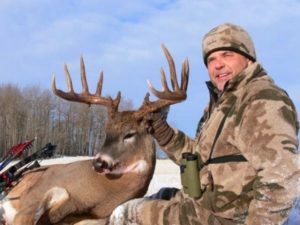 Southeastern Alberta is home to a very excellent mule deer population, with some very good trophies. This hunt takes place in Unit 124, along the South Saskatchewan River and the River provides access to the coulees inhabited by the areas mulies. Mid- October hunts. Many trophy bucks spend their days bedded in the sparse coulees waiting to feed in adjacent crop fields. The sparse cover gives the bowhunter the opportunity for a patient stalk or else a ground blind – intercepting the bucks moving to or from their feeding areas. You will see some great mulies- practice shooting out to at least 40 yards! Bring a good rangefinder! This area is about 3 hours from Calgary. License is about $45 Hunts are 2 clients for one guide, only 2 hunters in camp. You generally spend two nights in a motel- just before and just after the hunt. (about $80/pp). Lodging is a motel. This rut hunt takes place in the timber of the Drayton Area in western Alberta (Unit 337) during the peak of rut in early October. Hunting is done from a trailer base camp situated in the area being hunted. You may spot and stalk, call, or use stands. Expect to do some serious walking. Hunt is 2 hunters per guide, max of 4 hunters in camp. License is about $5o. Motels@ $80/night and shuttle fees of about $25.. You will drive from Edmonton to the hunt area. Moose will have to be worked for, but if in good condition the odds are 50 to 75% that you will have your opportunity. This schedule is subject to change depending on bowhunter’s needs. HUNT NATION: WE TELL IT LIKE IT IS! !